Bear has been craving a good hunk of a sandwich for some time and when I spotted an article in the paper featuring Reuben sandwiches here at Nassim Hill Bakery, we had to check it out. Now we actually entered through the back entrance and up the service lift lol, and our first visual was this big ole door with a sign that confirmed we were at the right place. It was a warm Saturday evening - not that we needed an excuse for beer :) I had the Grimbergen blonde (probably the only place in SG that serves this Belgian beer?) which was very, very good! Very smooth and light, a bit fruity/sweet. Must say it's one of the nicer ales I've had. The set up concept is quite 'open' and there weren't many other diners that evening, which added to the sense of space. Perfect for chilling out / unwinding. Oh my daymn ... first impression - this thing looks WICKED. 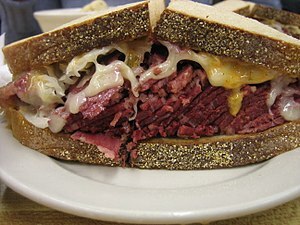 While it's clearly not close enough to New York Style in terms of volume (willing to bet you will not find them in Singapore) it had all the right ingredients - oozing cheese, saurkreut, onions, russian dressing, and that sweet sweet corned beef on rye. Even better - the rye is homemade with Grimbergen beer! Looks indeed, like a sandwich with STRENGTH. One bite and I am ... mm ... hmm ... hmmemmhm ... goodness. 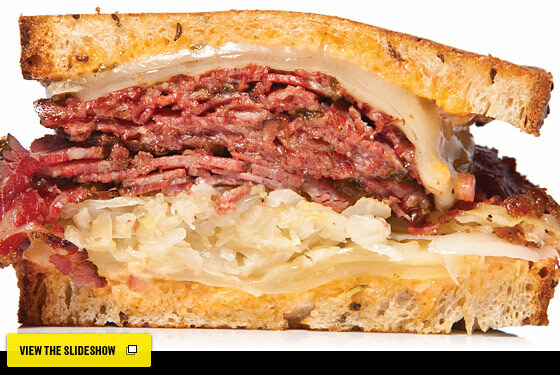 It's fairly close - while I wish the corned beef had more oomph (or actually just more corned beef) the overall sensation was nostalgic. Bread was top notch - delicious, flavourful and chewy, and the flavours ... they blend so perfectly. I was initially a tad disappointed by the lack of choice on the dinner menu, but realised that's actually probably a good thing. Settled for the meatballs and bread, which was actually the other item featured on the Straits Times article we saw. By golly, these are some serious meatballs! Second the ultra-packed meatballs and ultra-goodness-gracious rich flavour of the sauce. It's like the richness of the boeuf bourguignon sauce, but doubley thick and with beer. And the bread was fantastic as well. After all the delicious savoury nosh, we needed something sweet to balance our meal. I really liked our choice of apple crumble cake: generous chunks of apple within a not-quite-pie-nor-cake and crunchy pieces of granola (which we should have fought over for, but didn't lol). Was a (somewhat unexpectedly) lovely dinner and I really liked the beer - and hey, there's no GST nor service charge so prices are nett!